I’m participating in the Blogging From A to Z Challenge. 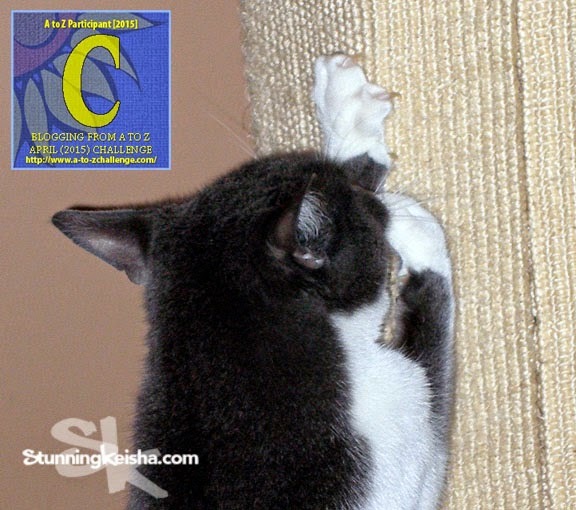 Today’s blog is brought to you by the letter C as in CLAWS! Did you really think I was gonna say anything else? I got sharp claws and I’m not afraid to use them. Oh, I don’t use them on the furniture, I use them to defend myself and to show my superiority. Here’s how I sharpen my claws. My claws are sharp and I have no fear. They strike terror into humans. The other day I was playing with TW. My claws barely touched her delicate aging dry skin and she got all kinds of scratches. The reason my claws are so long and sharp is that no one has the cojones to trim them—not even the vet. TW used to have a woman come to the condo to trim Nicky and Autumn’s claws once a month or so but when she saw me, she told TW she wouldn’t do it unless I had some Xanax or something. C is for Cinnamon, who’s 14 years young. This pretty calico is a special needs cat but don’t let that stop you from reading this and inquiring about her. She’s trained the volunteers to tell her story while she rests. Cinnamon is a great 14 year old lady who loves a good lap. She enjoys eating and lounging. Cinnamon came to us when her elderly owner passed away. She does fine with children and other cats. Cinnamon is on a special hypoallergenic diet that can be purchased at a pet food store, but does cost a little extra money. She also has hyperthyroidism which means she requires a pill twice a day which she takes in a treat pocket, so it is no trouble. Cinnamon also has a thing for towels and we supply her with one to pee on once daily. She never pees anywhere else except the towel and the litterbox. As you can see, Cinnamon has some quirks, but she is worth it! 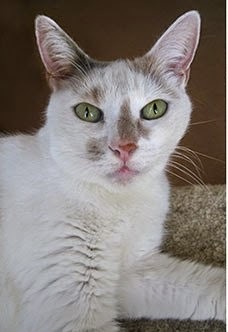 If you’re innerested in Cinnamon or any of the cats at PAWS (Pet Animal Welfare Society) in Norwalk, CT, you can find more information on their web site. During this Challenge I’ll be spotlighting adoptable cats from A to Z. If you have any fosters, rescues or cats that need to be rehomed and you want them featured here, drop me an email or message the Stunning Keisha page on FB. Our featured letter A cat, Annika, had found a home. Can we work our magic again? Can ya believe I's never scratched anyone wif mine? Claws sure maketh the cat CK. Have a fabulous Friday. Cinnamon seems like a very nice kitty! I wonder if she'll let her claws be trimmed! Claws is the perfect C.
Mom trims our claws almost every week! She has that old, delicate, dry skin too. You should have seen her when we fostered kittens. You do have some fierce looking claws. Cinnamon is a pretty girl and I hope she finds her special home. What a great idea to feature a kitty in each post. I'm sure you remember that I love having my claws trimmed up. That Cinnamon is sure a pretty girl. Have a fun weekend CK! Cinnamon is such a beautiful girl... so sweet. And her special needs are very easy things to help her with. We sure hope she finds someone to love and spend the rest of her life with. Purring like crazy that you work your magic again and find Cinnamon her forever home! She's one of our 2 sponsor kitties and has been waiting for way too long. Very nice claws. That is a pretty kitty, I wish I could go get her, but hubby is mean and limits me to 15. I hope she gets a forever home soon. you have seen my meme that is of Cody that says "I Have Claws And I know how to use them) it's on my personal facebook page, and I posted it last week...it's my FAVE!! Hooray for claws!! I LOVE Cinnamon! Hoping Cinnamon finds a purrfect furever home! Cinnamon is beautiful. I hope she find a loving home soon. 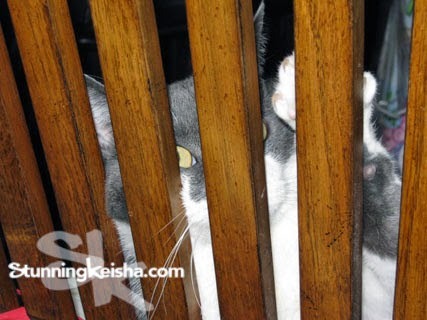 My cat, Jessie, has sharp claws too! She's 16 and has never in her life ruined any furniture, with the exception of one small corner of carpet by a doorway. Cat's are the coolest! Enjoy the A-Z Challenge! I'm doing it too, with my theme being ... Animals! Take care! I wish I could adopt them all! But I already have too many pets. Still, I think it's great that you're doing so much to try and help them get noticed! I had never had my claws trimmed until I got ill. I always kept them short but sharp by climbing trees and going for walks. When I felt too bad to go out, my claws got long and kept catching in everything. Mum said she was going to clip them for me and was expecting a big battle, but I just sat there and let her do it. I hope Cinnamon gets her home like Annika did. Will share about Cinnamon!! :) CK, your claws are your bartering tool. Keep them sharp. Keep them ready!! We're not fans of having our claws cut, but when we do, we get treats so that makes up for it.